Q: Think of two synonyms — one in 5 letters, the other in 4. The 5-letter word starts with S. The 4-letter word contains an S. Change one of these Ss to an A. You can rearrange the result to name a group of people, in 9 letters, that ideally have those two adjectives describe them. What group is it? Here’s a tip for you all: it’s not saucy and smug. I spent (used) too much time on a false scent (nose) which didn't make me feel smart (wise). Much as we love to travel, I didn't want to go there. Try SURLY + BASE = The Rock Group: BALAYEURS du Désert. No need to travel. I have several more answers. This is a good clue in the sense that it didn't lead me to the answer, but did confirm that I got the right one. I would compare this week's challenge to a crossword puzzle with no right answer. Oh, I think it was tailor-made for this group. So glad to have another closer cloth offering. These two adjectives could describe so many groups, professions, or types of people. I got this one quicker than I'd expect, considering how many possible nine letter words exist. For that third word, the group, don't assume anything based on plural/singular forms. Jerry Lewis and Dean Martin are back together again. Pardners, again? His Wikipedia bio describes Lewis as afraid of dying, so Scared Stiff, maybe? They're certainly not Living It Up. I heard a different version of the puzzle, since my wife was on the air, and the clue Will gave her was altered in editing before the final broadcast. Regardless, I ended up with a serviceable answer. Did you hear a different version of the on-air puzzle, or the one we're working on for next week? Either way, congratulations on your upcoming baby! I tried to leave a comment on last week's post to mention the different clue! I'll mention it below so those who might consider it a spoiler can scroll past it. Will originally said both adjectives end with a T, not that one starts with an S and the other contains an S. Both versions of this week's challenge lead to the same answer. We are wondering why he changed the clue to the one that aired. Had to go high up in the mountains to get this one. The piano has got drunk, smelling the salt air from the boardwalk. Looks like everybody here has got the answer and …don’t tell me... you’ll all hold off until Tuesday afternoon to send it in. Just got it! That was quicker than I thought! Just goes to show if you have the feeling you can't solve it, just shake it off! My feelings on rearranging letters are well known and having to add or change one to make it work doesn't ordinarily improve the exercise. In spite of that, I have to to say that I think this is a quite clever puzzle. If it weren't for having to change that S to an A, I'd have said that it was clever to observe that those two synonyms apply (ideally) to the anagrammed word. As it stands, though, I see this as more of a slog. I’m with you on that one. These anagrams are too easy helped with applications. I much prefer more of a riddle that you really have to think about. I agree with BB and jan, but that being said, this time I am happy with this puzzle. This is because on my middle of the night call of nature I read the puzzle and returned to bed, this time with a notepad and pen. I thought about the nine letter word for a bit and then thought about what the two words could be. I came up with two synonyms that I thought could work and wrote them on the top of the notepad and then went back to sleep. I got up several hours later and tried a couple of nine letter words on an anagram server with no results. Then I remembered my notepad and entered the words into the anagram server with the minor change and viola! So, I did not have to use any lists or anything other than a bit of logical thinking to come up with the intended answer, and that is why I am okay with this one. I would suggest not trying to solve it with the nine letter word, you will not succeed that way. I got it, thanks to the subtle tips from the comments above! Why does the subroutine dodge without a familiar fence? I've been among this group, and those adjectives are good qualities to have. Well, maybe you like those people to do the opposite. Maybe the Blainesvillians are a special group. Ah, I see. When said "this group" I thought you meant this group of Blainesvilleans. This is a puzzle that could fly in the face of reasonable expectation. Sharing that story is the most heroic thing I have encountered in a long while now. Thank you very much. I doubt that you sent your answer in or you would have received an email reply from NPR already. On the bright side, think of it as getting two puzzles this week, and you get to solve it all over again. And you will too. Pretty cool eclipse, was able to see it all! We had heavy rain beforehand and all of a sudden the skies cleared. It's now completely overcast. About one minute of totality. So Trump thought he could stare directly at the eclipse? Reminds me of that poem by John Milton. The poem I had in mind is Milton's "On His Blindness," which ends with the line "They also serve who only stand and wait." Blue skies and almost no clouds in the St. Louis metro. What a fantastic event! That was so neat seeing the sun's corona! I was watching for any high speed aircraft trying to chase the eclipse & saw maybe one. I was too busy watching all my equipment and the neat view. Spectacular here in Colorado. Clear skies and 92+ percent totality. The eclipse glasses worked well. Thank you for confirming my answer. Btw good job Sunday morning. Great, and thanks! It's really odd not to submit this week. No doubt, some of us have been a part of the group I submitted as my answer. Also, all of us have had contact with members of this group. Finally, members of this group are involved with an NPR program other than WESUN, although not in the way you think. If I'm picked this week, it'll be a Mystic Valley trifecta: last week's winner, this week's puzzle submitter, and this week's winner all from adjacent towns along the mighty Mystic River. I thought it was a bit odd they didn't mention that Somerville and Arlington border each other. Rooting for you to continue the Massachusetts puzzle dominance! Hope you get the call. 'Twould be fitting if a trio of "Mystics" be picked to participate in Will's puzzledom! Shari, you did wonderful on-air, did us proud, and got the Blaine's shout-out in to boot! Congrats too on your newborn-to-be. The phrase "Buffalo Wild Wings" comes to mind. Here in Seattle we have had a totally clear blue sky day with temperatures in the eighties. I thought it might turn any moisture in the sky into a thin cloud cover, but that never happened. A very few of us went out in the road to watch and a couple of neighbors offered me use of their viewing glasses. I took two looks for not much more than a quick glance, but it was worth seeing. Other than that not much to write home about. No animals seemed to be bothered as it did not get dark. Without the glasses and knowing to look I doubt I would have noticed. I am so glad I did not stay in Oregon to see it with all the hordes of screaming humanoids. I am now anticipating what our Confounder in Chief is about to tell us he is going to do to escalate the war in Afghanistan. We were in the path of totality down here, sdb. And have never seen a corona in person before, THAT was the spectacular part, short as it was. It did NOT get completely dark (to my disappointment), but it DID become noticeably cooler, which was wonderful. I went to campus [via bicycle] to be around others for the event, and enjoyed when everyone cheered and applauded. Much more fun than being all alone. Then I found out, via text, that my older son had flown to St. Louis yesterday (surprise) and thus HE would be able to see totality, after all, whereas if he'd stayed where he lives, he would not have. However, they didn't have any eclipse glasses, so I emphasized how utterly remarkable that corona was, and tried to convince them that they could watch totality without glasses.....they still were skeptical, and thus took only half-second peeks at the thing. But it was a kick to be texting with a loved one more than halfway across country, as he and future wife/in-laws were experiencing what we just had an hour earlier. Re the puzzle, I appreciated the additional hint [about the ending in t's] from Sunday's broadcast, because with that info, I was able to solve it. Don't think I might have otherwise.,,,NEVER would have thought of the nine-word group, that's for sure. VT: You don't say where you were for the eclipse. Also you have no online profile, so I have no idea where you are or were. You may have said before, but I don't always remember incidental information like that. ViolinTeddy: It is really great to hear your eclectic eclipse experience! I was so amazed by how dim it got during the corona, and I certainly wasn't expecting the cheers and vocal excitement from the crowds. People were so into it! It was a day time block party in my neighborhood. BBQ lunch and musical talent. Some people even took the day off work. Kids stayed home from school. It was a party! That sounds really nifty, clotheslover! I hadn't heard of block parties with music happening, but why the heck not? I'm glad you enjoyed my own description. “The men and women of our military operate as one team, with one shared mission and one shared sense of purpose. They transcend every line of race, ethnicity, creed and color to serve together and sacrifice together in absolutely perfect cohesion. That is because all service members are brothers and sisters. They’re all part of the same family. It’s called the American family. They take the same oath, fight for the same flag and live according to the same law. They’re bound together by common purpose, mutual trust and selfless devotion to our nation and to each other. The soldier understands what we as a nation too often forget, that a wound inflicted upon a single member of our community is a wound inflicted upon us all. When one part of America hurts, we all hurt. And when one citizen suffers an injustice, we all suffer together. Loyalty to our nation demands loyalty to one another. Love for America requires love for all of its people. But wait! Note that In President Trump’s most recent speech, the sentence beginning “They transcend every line of race, ethnicity, creed and color…” does not include “gender identity" among the “many line(s).” He may not be mea culpa-ing after all! My first thought on his speech was that he did not write it, it was scripted for him. I wonder then who is controlling this puppet. I didn't hear that much of a change in policy, either. Maybe I could go along with not announcing troop reductions but what is the harm in announcing a troop buildup? There was no announcement on troop strength. There was no change in strategy. In fact, he merely passed the buck on strategy to the generals, in case something goes wrong. His ideas on India & Pakistan sounded like pie in the sky idealism. It all seemed like a diversion from his many domestic problems. 68C: I could only watch the beginning of his BS, but I think you summed it up accurately and well. "The Eclipse of a Nation" was truly spectacular in south central Idaho (Sawtooth Mountains). A pair of ospreys seemed confused; the rest of us enjoyed the show, though it was the fastest 2 minutes ever. SDB and WW (and others): sorry you didn't travel to the path of the totalitarian state, it was and will be magical. And ViolinTeddy, too bad your son didn't look at the full corona, the NASA website said it's as bright as the full moon. I stared for the full 2 minutes, and my eyesight is perfexrkt dubw! I also took photos (two or three with the diamond ring), and can share if anyone is interested. Going backward in time (not a lot of wi-fi or plumbing in the back-country), last week I wrote "I see the two shows have one thing in common" - Candid Camera's premise was to spy on people, the main character in American Dad! works for the CIA. Well, eco, when one resides in a totalitarian state (I love it!) one does not have a need to take that path. Glad to hear you got to see it and enjoyed it. You did not mention the traffic or crowds, or how the ospreys tasted. I would enjoy seeing your photos. Welcome back, eco! The Sawtooths are beautiful country. I'd enjoy seeing your photos also. Are the Sawtooths ivory? And do any of them suffer from Tuscaloosa? SDB: I went up on Thursday, got one of the last "formal" campsites (too old and unprepared to dig pit toilets, etc), so no traffic on the way up. Left a bit later to avoid the traffic back. I had scouted sites for viewing, including an 11 mile hike, but ultimately decided the sun and the moon were the show, so a group of us watched from the campground. I'm sure there were crowds at the NFS "viewing sites", but I didn't see them. One "entrepreneur" set up a viewing site on his property, and you could park in his field for just $50.00! I hope no one was stupid enough to take him up on that offer. And I assume ospreys taste just like the rest of us, a combination of smell and buds on their tongues. Composition of the Sawtooths? I'll just take it for granite, WW is the geologist. They are a marble to look at, though the smoke from Montana wildfires were clouding the view. Folks were hoping for moraine, even to porous a storm was a sediment widely held. Were I not so jaded I would respond to your quarry. Shale we continue this later? The granodiorite of the Idaho batholith is a wonder; you could die right there. Fascinating schist! Quite gneiss in fact. Never met a more phose I didn't like :-). SDB: I'd like to gabbro, but it'slate. Glad WW and others lava good line. "I'm gonna jump in a crater. See ya later!" And yes, the new image is from yesterday's eclipse. "If you're in outer space, don't feel, out of place." Who would have thought one album could have two so significant songs? I guess at your age you're feeling just bit sedimentary, but I'll leave a lamproite on for you. I'm sure it gets tiring when you realize there's norite answers to your problems. Tuff luck. eco, did you take the eclipse image? What sort of camera set-up did you use? Did you feel a shutter when you took it? I did take that picture, and this, and about a dozen more - it was hard to look up, look around, and shoot at the same time. Nothing really special in the set-up, Nikon D3400 camera with a 70-300mm zoom, turned all the way to 300. I wish I had a longer lens for both these and the pic's of bighorn sheep and ospreys. But in my daily life I use my 18-55mm much more often. No tripod, I put my faith in auto-exposure which worked reasonably well. I suppose I could have set up more, but there are only so many hours in the day, and minutes in the night. Thanks for the camera scoop, eco. Quite fabulous images, especially sans tripod. Looking for the osprey next. . . I only tripod once, and felt wobbly after. 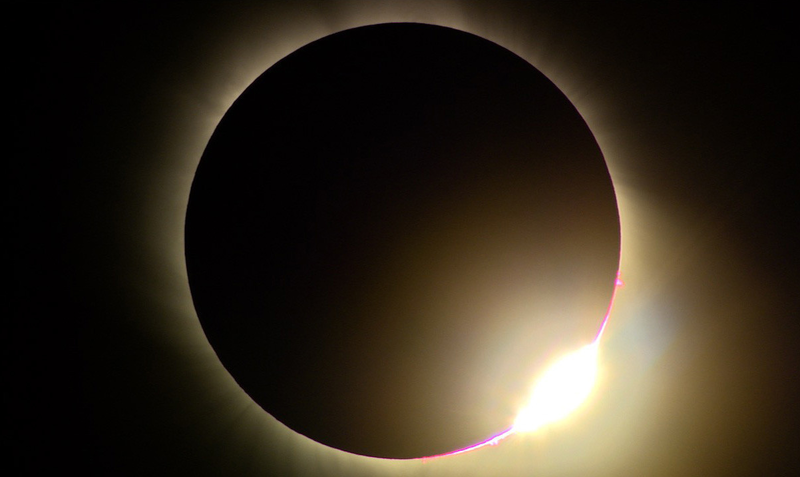 ECO: my son DID look at the corona, but only briefly a number of times...i.e. not steadily, since despite my assurance via text, he didn't think it was really safe. At least he saw something of it, for which I was glad. VT: how unusual, typically it's the mother that's overcautious, not the son. You're lucky to be in Corvallis; one of my clients said she waited before leaving the Bend area, and it still took 9 (not 2.5) hours to get to Klamath Falls! Eco: This son of mine has ALWAYS been super careful. He didn't even crawl (and it was backwards) until 11 months of age, and didn't WALK by himself until 18 months! So his corona-viewing abundance of caution was right in line with his personality since birth! My daughter and I saw interesting lines on the concrete walk we were sitting by a few seconds before and a few seconds after totality. I didn’t realize it at the time, but these lines – called Shadow Bands – have been known about for centuries. No one seems to have a definitive answer as to why they occur. Paste this NASA URL in your browser for more information. Did any others here notice Shadow Bands where you were? Chuck - I did not notice those bands but I was not looking for them either. This might be the first I had heard of them. Like Eco was saying, those two minutes of totality go fast, real fast! If I get to see the next eclipse in 2024, that would be something to look for. Eco, glad your vision survived intact. A crowd of young people came to look at the simple setups I was using to view things with, and many of them were trying to view things with their bare eyes. I had several extra glasses so I started handing them out. They were very grateful! It was also neat seeing two planets near the eclipse. I think they were Mars & Mercury. I was pretty sure it was Mercury because it definitely was not a Crown Victoria. My old Mercury has a few mars. A photo of our Colorado shadow bands are at the end of this week's Partial Ellipsis of the Sun . ww: Maybe those are not the same bands. Yes, Chuck, re shadow bands. I forgot about them, but a nearby lady told me that they were showing with the shadow of a tree's leaves, and pointed it out. By the time I saw it, they weren't so great, but she had taken a picture with her phone and you could SEE the crescents. Of course, at this point, i don't WANT to see crescents, because my post-surgery right eye sees them all the time when there is a light in the darkness (or even on shiny indoor fixtures.) It turns out to be refraction on the edge of the damn plastic lens replacement (it got somehow 'decentrified.) This is off topic, sorry! It was neat seeing Mercury in the middle of the day. Usually you can only see it near the horizon at dusk or dawn, because it is so close to the sun. I wrote an essay about our trip from Dayton to Kentucky to see totality. It's probably too long for here, but if you'd like to see it, please e-mail me at robhardy followed by the numeral three at gmail. If Trump thinks his razzle-dazzle about White Supremacists is going to distract Mueller and keep Junior out of jail, he is wrong. If he thinks picking out a new and powerful enemy in Pakistan is going to do any thing but threaten new war, he is mistaken again. It was impossible that man could become President. Was it Oliver Cromwell who said, "Trust in God and keep your talcum powder dry"? All day I have been hearing reporting on NPR re: Trump's war escalation speech last night which he began by stating we had been there seventeen years. What moron wrote that? And why doesn't our Idiot in Chief know we have been there sixteen years? Not seventeen years! We had to stay in Dayton, but our view was satisfying. Oh! If I was supposed to know this before, I didn't. I live in Dayton, in St. Anne's Hill. Yes! And my son has bought two houses next to Smale's and is renovating them. Here is a sneak preview of a Rip-off of this week's Will Shortz NPR puzzle that will appear on Puzzleria! this Friday. Please don't give the answer when you solve it (wait until Sept. 30 on Puzzleria! ), but you can give hints if you like. Think of two synonyms — both 5 letters long. One 5-letter word starts with S, the other with A. You can rearrange the 10 letters in these words to name devices with which a regular contributor to both the Puzzleria! and Blainesville blogs is very familiar. Both synonyms could describe the contributor, or the contributor’s puzzle-solving skills. What synonyms are these? What device is this? What contributor is this? Lego: that is quite a rip, but what's the point of waiting until Sept. 30? Thanks, eco. When I post puzzles on Puzzleria! each Friday I give solvers until the following Wednesday to solve them. For example, today beginning at 3PM EDT, solvers will be posting their answers to last Friday's Puzzleria! puzzles, just as tomorrow at 3PM EDT, solvers will be posting their answers to Will's NPR puzzle here on Blainesville. How about this: post your answer to this rip-off this Sunday morning after Blaine posts NPR's next puzzle? In the meantime, feel free, as Blaine puts it, to "provide indirect hints to the answer to show you know it." This rip-off is merely one of about eight or nine puzzles I shall be serving up on Puzzleria! this Friday. I think you missed my message, you wrote Sept. 30. I know there's a time zone difference between California and Minnesota, but is it September already? Oops! You would think a Minnesotan would want to hold onto summer a little longer, let it linger! I guess my brain is still a bit frozen from our last Minnesota winter. Not to worry, Lego, two other friends thought it was September this week. I've solved it also, cute. Okay, Ron, I'll rate it as "cute" also. That gives us two. Coming up with a solution to Lego's rip off requires a true leap of faith. Yes, but why the early airing? I feared, skydiveboy, if I waited to long that the outcome might not be pretty, perhaps even fatal! Lego, what I want to know is how CB knew about my extensive and expensive hat collection. Yes, sdb, that amazed me too. I almost posted about it (I guess I am now doing that), but I thought nobody would know what the heck I was alluding to (which I'm sure they still don't). It is a cool coincidence, to be sure. I wonder if Will is in league with a certain pop star this week? I thought of the adverbs fairly quickly but ignored them because I couldn't see how anything could be formed from those letters. I reconsidered when the information about the terminal T's appeared, but couldn't figure out what all the 'tailor' hints were about until I read 'certain pop star'. Adjectives. "I thought of the ADJECTIVES fairly quickly," he slowly realized. In answer to Lego's early ripoff puzzle, SHARP and ADEPT can be rearranged to spell DAPPER HATS, but if that's the answer, he's obviously not referring to me. I have a few caps, but I've only occasionally worn the newest one. Frankly, I was expecting a comment from Tommy Boy this week. Tommy Boy used to contribute to this blog regularly and still does occasionally. Pointedly, the hint was really about Tom Swift. Well la-ti-da, I got one number on the Powerball. Looks like no "Grey Poupon" for a while! "Had to go high up in the mountains to get this one" referred to The Alpine Lodge (and their WAITSTAFF) owned by Dean Martin and Jerry Lewis. Mr. Lewis died Sunday, as sdb noted. Hinting at a several course meal in a fine restaurant. > I have an answer that works, but I'm not at all sure it's what Will intended. Guess I'll have to wait until Thursday. >> I would compare this week's challenge to a crossword puzzle with no right answer. > Oh, I think it was tailor-made for this group. > I wonder if Will is in league with a certain pop star this week? She just announced a new album. Replace an S with an A and rearrange to: WAITSTAFF. My comment about taking Diane to breakfast was intended as a pointer to restaurants, with breakFAST being an unintended extra hint. Had I recognized it as such before posting I’d have said we were going to brunch. Last Sunday I said, “Here’s a tip for you all: it’s not saucy and smug.” A tip for the waitstaff. I wrote, "Speak softly and carry a big stick." By this I hinted at a weight(y) staff. Thanks for all the good "tips to solve this. And the Country singer I hinted towards was of course, Taylor Swift. "Btw Smales hot soft pretzels is its own food group." This is an actual Dayton 'hot spot'. 'Food group' puts a 'twist' on the answer of waitstaff. SWIFT + FAST (changing an S to an A) anagrams to WAITSTAFF, restaurant waiters & waitresses, first known use: 1981. “Ideally” the waitstaff are swift & fast. I referenced "Shake It Off" by Taylor Swift, and then Buffalo Wild Wings, which advertises if you have lunch there, it's 15 minutes or it's free. That means their WAITSTAFF has got to be FAST. "The piano has got drunk, smelling the salt air from the boardwalk.”… The piano has got drunk, from a song by Tom WAITS… smelling the salt (water TAFFy) air from the boardwalk. Eclipse photos coming soon, meanwhile in response to 45 I made this. I guess now we really know what a stuffed shirt is. I like it, good one! Probably better than the original, too. eco, let os prey. Great image. This week's new Puzzleria! is uploaded. This week we're serving up a truly clever wordplay puzzle by cranberry (Patrick J. Berry) plus about eight or nine other challenges. Come join in the fun. Go to Blaine's PUZZLE LINKS. Open "Joseph Young's Puzzleria!" Welcome to puzzles galore. Thank you. Looks like Corpus Christi is about to get slammed. Those folk should do like Trump and take the higher ground. Sure is awesome seeing the power of a hurricane. I just can't imagine 25-35 inches of rain. I like scanning the shortwave radio bands, listening for people reporting storm activity. Not that much traffic yet, I think Facebook does a lot of that these days. Let's see how DT handles this one! I bet gasoline prices are about to skyrocket!! He'll handle it with little hands. Using Harvey as an excuse, gas prices have already started to rise. Watch how slowly they go down. I fear there will be once again too many victims of poor government management. And if it's like New Orleans (we had a rebuilding conference there 2 years after Katrina, what a nightmare!) it will be poor and minority communities that will be hit hardest. And even those that voted for the orange monster don't deserve it. Eco - I hope they've learned something! 68C: what they've learned is they can take us into meaningless and endless wars, ignore and kill poor people, crash the economy, and do countless other things to destroy civilization and our futures, and still steal an election. Eco - What gets me is 40% still voted for him/them & another sizable group didn't even vote!! But I think you are right, it's just that voters keep re-electing these people with blind allegiance. eco - Right! And those are just their good side. I wonder, now that tRump has pardoned Arpaio, will he next pardon the #$%W@ who killed Heather Heyer in Charlottesville? He was one of the, "Fine People on both sides," wasn't he? And no doubt he will pardon anyone and everyone that falls under Mueller's scrutiny, including himself if he can. And if he can't Pence will let him off. He's a unifier, isn't he?? Maybe he'll be so busy signing pardons he won't have time for much else to destroy. Since Trump has said he endorses waterboarding, Shouldn't Mueller be allowed to use it in his investigation? Supposedly, Ambrose Bierce once said that "War is God's way of teaching Americans geography", but natural disasters can have the same effect. I don't think so. I believe Mr. Bierce was pointing out that citizens of the U.S.A. have little or no awareness of the rest of the planet. Isn't that the same thing? I've seen this quote attributed to several people. But I think the implication is the same, it applies to Americans in general, whether it's a war or a disaster. It is about our narcissism and self-centerdness and jingoism. Since our wars, with one big exception, have always been fought on foreign shores they have the unintended consequence of forcing our combatants to learn about others, and they tend to come back home changed. Natural disasters that occur within our borders do not have this effect. I think it is the same thing, that was the point of Bierce - or whoever said it. But what will it take to teach Americans history? I still don't think so. We are somewhat isolated from most of the rest of the planet, whereas most other countries are jammed together and therefore forced to learn about others. It is not uncommon for Europeans to speak several languages, and to have traveled to other countries. Even today most here do not have passports. Most of us here do not know much of anything about what is happening in the rest of the world, and cannot name world leaders of other prominent countries. Recall the other saying about young men returning after WWI? Arthur Fields - How Ya Gonna Keep'em Down On The Farm (After They've Seen Paree?) (W.Donaldson), Victor 1919. It is not simply a slap in the face, but a forced immersion into the reality of others that I believe the quote refers to. I don't think 68C or I would disagree with anything you write; Bierce succinctly states that Americans are isolated and ignorant beyond our borders. Occasionally a war induces or forces us to learn a bit about the rest of the world; once in a while a natural disaster like an earthquake will do the same. Trump (and Sarah Palin, Dan Quayle, Spiro Agnew, Barry Goldwater, and even back to Harding and Coolidge) have told people to take pride in their ignorance. I still don't understand how a natural disaster teaches us about other parts of the world. I have always believed the quote was referring to war forcing people to travel to foreign places. Oh, eco, they do, they do. I just this moment got an unexpected phone call on my landline. You know the kind. You answer, "Hello" and there is a long blank period. You now yell, "Hello" once more and then finally some voice answers, stating, "This is not a sales call." I answered, "Then what the F**k is it? I want to f**king buy something!" And then I hung up. Next week's challenge: This week's challenge is a common two-word expression. The expression consists of 8 letters and uses all five vowels — A, E, I, O and U. It has only three consonants, one of which is repeated. The first word in the expression has two letters and the second has eight letters. What familiar expression is it? Be cautious: either that consonant appears three times, or one of the vowels is repeated, too. If it's only 3 consonants total, wouldn't it mean that you'd have consonants B B C, and *more* than one vowel is repeated, or that one vowel is used 3 times? Or... perhaps it's more like B B C D, plus A E I O U and one vowel is repeated. Or, B B B C D A E I O U and that's it. Obviously I do not yet have the answer! --Margaret G.
I'm confused. One sentence says expression consists of eight letters, and another sentence says the second word has eight letters. Any clarification? On air, Will said the expression was two words, 2 and 6 letters, which makes more sense. If there are only 8 letters altogether, none of the 3 consonants would need to be repeated. I think he meant there are 8 different letters. But since I haven't found the answer yet, I may be wrong. "Just over 250 correct entries" last week. ...On the other hand, parsing the puzzle Word Woman's way does yield a plausible answer. ... in which there are only two different consonants, one of which is repeated. ... and which bears a certain resemblance to the last puzzle Will posed in which we were asked to find two words containing all five vowels and three consonants. __ _________, you Esmeralda? No, guess not!